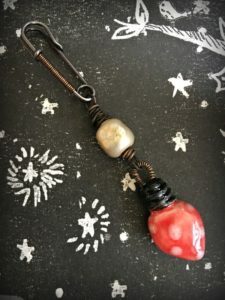 Handmade gifts! Oh, what fun it is! 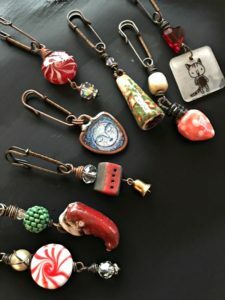 Holiday greetings from The Earring Whisperer, Loralee! 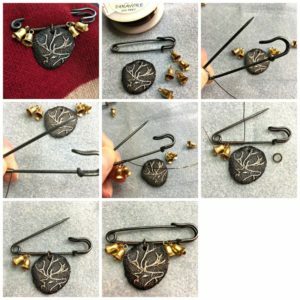 Along with earring making… pin makin’ is also my favorite thing to do! From left to right, here are the artists: 1.) 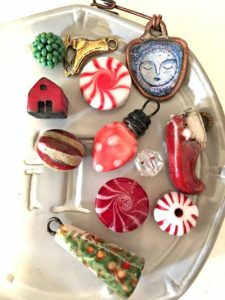 Lampwork peppermint drop, by Amanda Craigmyle. 2.) Beaded-bead, by Songbead; Ceramic elf shoe, by KiyoiDesgin. 3.) Ceramic barn, by Jubilee . 4.) 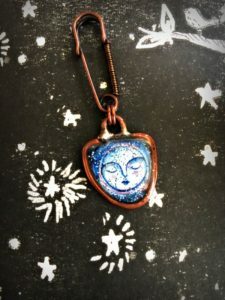 Glittery Moon, by Gaea. 5.) Christmas tree, by KiyoiDesign. 6.) Ornament, by Gaea. 7.) 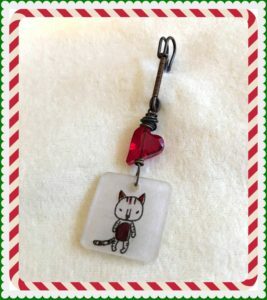 Kitty charm by Azalea of Green Girl Studio. 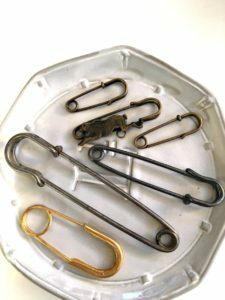 You can find a wide variety of pins in all sizes and finishes on Etsy or a craft shop. 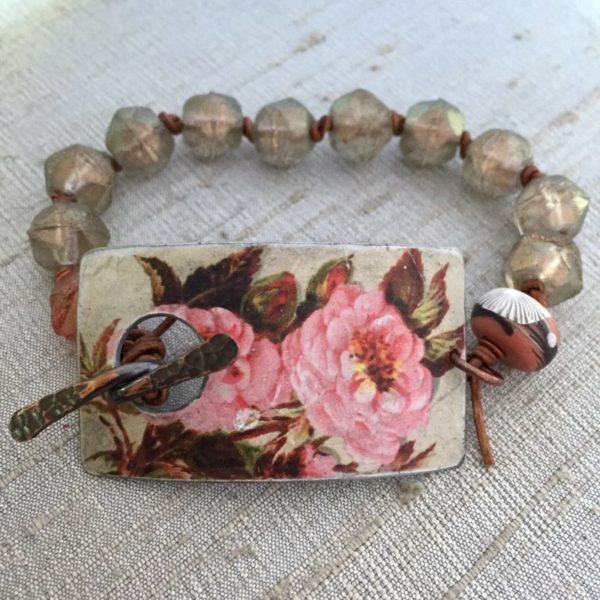 …and I know there is already an “everything dish” of charms and beads on your worktable! 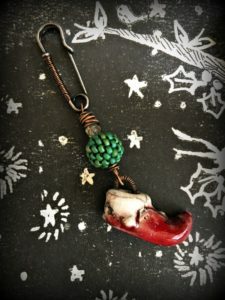 One of my absolute favorite bead-makers is Foxpaws. I have chosen to take one of my precious earrings pairs and separate them! 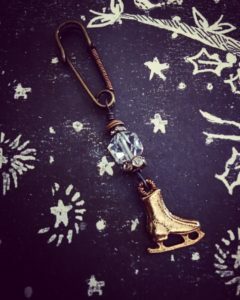 I found these little vintage bells and thought, how sweet they would be along side one. *Note: In the second row of photos, you can see I stopped winding the wire and added a jump-ring. You can stop and restart adding wire at any point. Never worry about running out of wire while winding – it’s easily added. Also, if you’re not comfortable working with long lengths of wire, feel free to cut it. You’ll need approx 24″ of 26g or 24g wire. 1 open jump-ring. Size of the ring will depend on your charm hole distance and opening size. 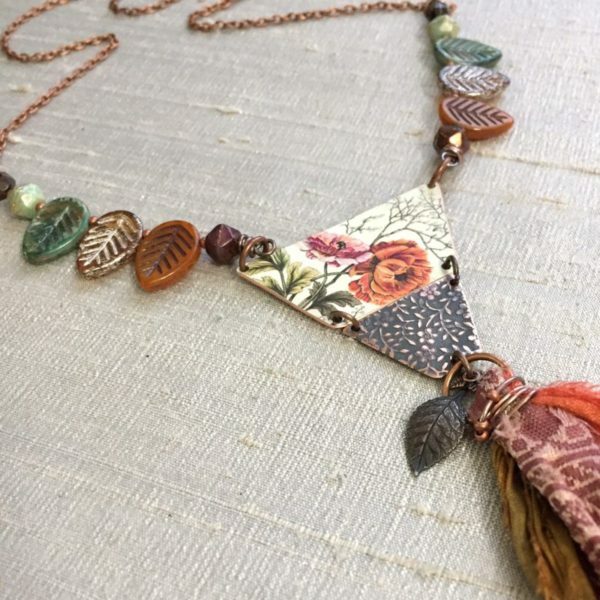 Hope you’ve found a little gift inspiration here today! 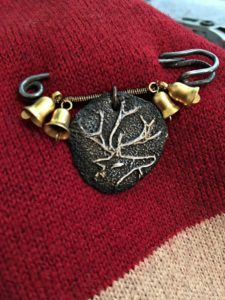 I would like to make a special note on one of my favorite charms, made by Azalea, of Green Girl Studios. 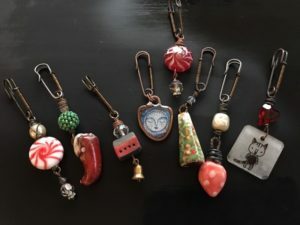 For the last couple of years I’ve picked up a few of her charms at her Mom’s Booth at Bead & Button. To me, this pin symbolizes the sweetness of Christmas. I LOVE these pins!! Each one is so sweet and lovely. OMG, I didn’t see Azalea’s charms at B&B because I definitely would have gotten some. It is so wonderful! But thanks for the heads up; I will look for them next year and hope there are some there. You know all the best makers! Meanwhile, I see a pin in my future. Thank you so much for the tutorial! Love them all! fantastic work, my friend! 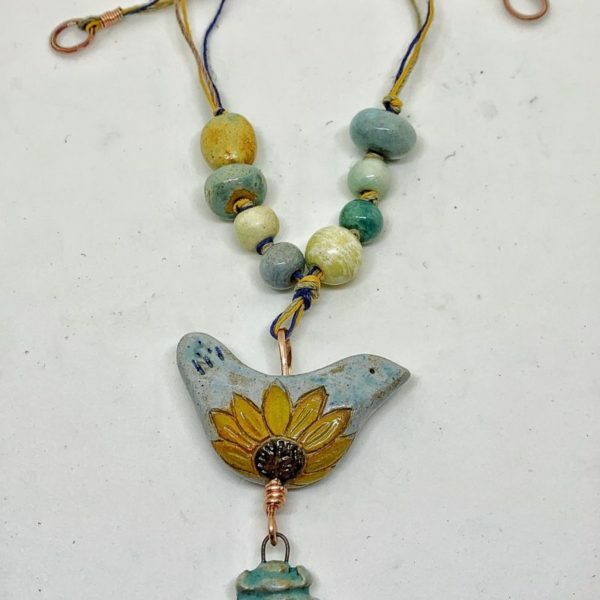 What a unique and adorable way to highlight some very special beads…sure to be treasured as gifts! Everyone can wear a pin– I loved wearing one in NH on my winter coat or sweater. Fun to attach one to a gift. Have to find a place for one in FL! !